For some, the fall is synonymous with hunting season. People gather up their camo, their rifles or bows and arrows and head to the woods for wild game. For me, it’s the dead of winter… and I’m not hunting animals of any kind. I’m hunting sticks. In the dead of winter, the sap in the trees and saplings is gathered in the roots. Cutting the saplings now means the wood is already half-dry and this lessens the time it takes to cure the wood. This also means that there is a lot less chance that the wood will check or split. To further minimize the possibility of losing a potential broomstick to checking or splitting, we cut all of our handles longer than needed at first. Most of the saplings – which start out up to 12-feet long – are cut down to 60-inches before being stacked to cure. Why that length? There are several good reasons. One: Our handles for our kitchen brooms are 42-inches, which means there’s an 18-inch remnant, which is the length of our hearth broom handles, or a 36-inch parlor broom handle and a 24-inch child’s broom handle. Two: If a check or split does happen, we can always trim and still salvage a handle or two. Sometimes, we dig up a couple roots, too. Sassafras roots we use for making sassafras tea! Other roots we use to carve spoons and ladles, or trim them down to use as mauls. And, we don’t stop there. The smaller trimmings from the handle lengths listed above are often carved into spoons or turned into crochet hooks or knitting needles. A lot of broom makers hunt for only sassafras. Not us! We will take most any straight hardwood. We avoid pine because it rots too quick, and we avoid cedar because it splits too easy. 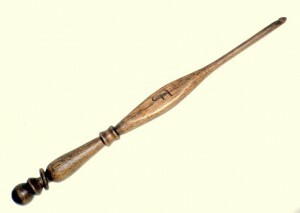 Besides, it would be boring only making wooden items from sassafras, as much as we like it. You call them scratches. We call them Arkansas Tattoos. Of course, there’s another reason for stick hunting in the winter. Without the greenery, it’s easier to see where your going and find the saplings you are after. 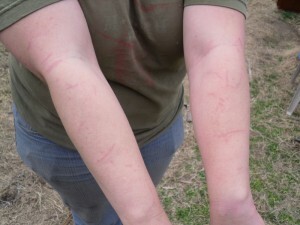 You’re also (sometimes) forced to wear layers of clothing to stay warm, and that prevents the thorns – and there are a lot of thorns in the Ozarks – from tearing up a persons arms and legs.